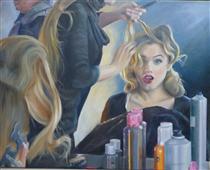 DHC Interiors presents: This oil painting was from a candid shot taken in New York City at a photoshoot. Couture wedding gown designers Michelle and Henry Roth were the hosts at Canoe Studios. Avery Tharp is the beautiful model getting ready for her shoot. This is part of my wedding series.